by Robin Rose Bennett Author · Rosemary Gladstar Author of introduction, etc. 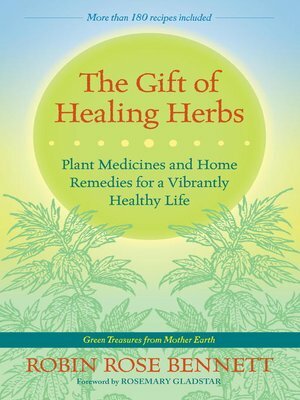 With more than 180 easy-to-follow recipes informed by the wisdom that physical and spiritual healing are inextricably intertwined, The Gift of Healing Herbs explores herbology as the "people's medicine", freely available to all, and as a powerful yet gentle way to heal body, mind, heart, and soul. The book is divided into three parts: the first part examines health and the causes of illness; the second part comprises a reference of all the physical systems of the body and the common and not-so-common herbs for tonifying them; and the third part contains recipes for teas, brews, and instructions for incorporating herbs into our daily lives. The hundreds of recipes for herbal preparations in this book—accompanied by prayers, meditations, and rituals—offer spiritual and physical insights into the relationship between our body systems and the elements, Earth, Air, Fire and Water, thus helping the reader explore and experience the interconnection of all things in the web of life. Filled with personal stories, case histories, and elements of personal memoir, The Gift of Healing Herbs is equal parts inspiration and instruction drawn from the author's life and decades spent teaching and practicing herbal medicine in a spiritual, earth-based, nondogmatic style. The author explores how one's personal story turns into one's embodied physicality and ultimately reveals individual unique paths of healing for each reader.